Rear discharge: The wide, even dispersal of grass leaves a fine thin layer directly behind the mower, vs. a possible windrow to the side. 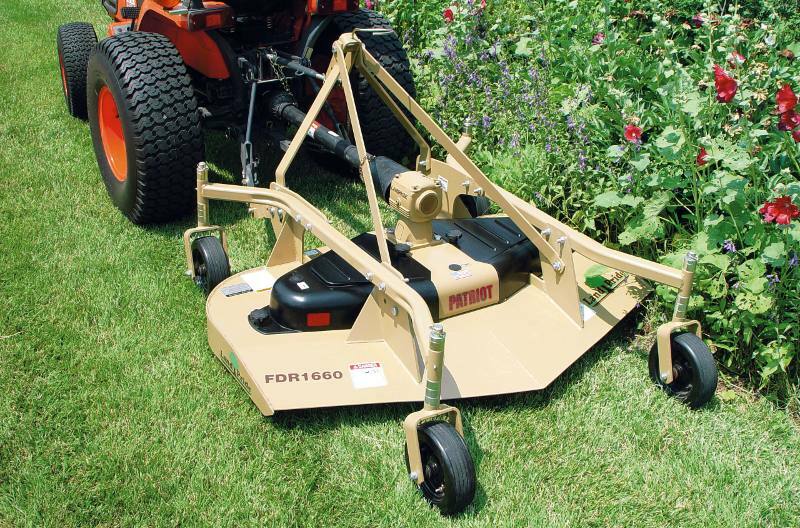 Keeps grass from blowing in unwanted areas. Easier to mow around objects. Deflectors: Built-in to throw material down, as well as forcing thrown objects down. Clevis type lower hitch points: Allows for easy hook-up by being able to remove pins and back into clevises. 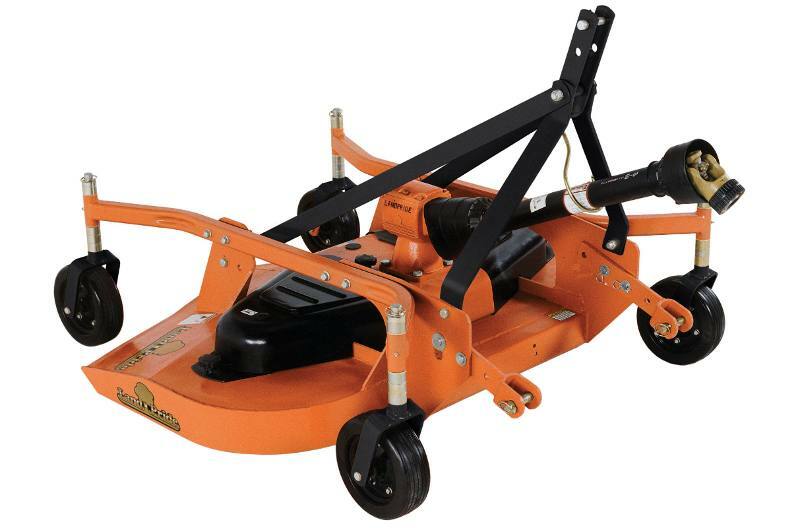 Floating 3-point: Top and bottom hitch points float up and down which allows the mower to float over uneven terrain. Roll formed front on deck: 3/16" roll formed front deck edging for greater strength and impact resistance. Frame-over-deck design: Frames takes stress out of deck by supporting it. 3/16” Deck thickness: Heavy deck material to aid in overall strength and longevity. Reinforced spindle mounts. Lower hitch points adjust in and out: Accommodates many tractor configurations by adjusting in and out. Hard rubber tires: Hard rubber tires are sandwiched between the rim halves, bolted in and can’t go flat. Roller bearings allow for a long life. Heavy-duty Gauge wheel arms: 1/4” Gauge wheel arms increases strength. Non-aligned gauge wheels: Rear wheels don’t track behind the front wheels to reduce laying grass over. Choices of Blades: Low, medium, high-lift, or mulching blades are available to match customer needs and specific applications. Blade overlap: 1" blade overlap assures no skipping in tight turns. Heavy-duty roller bearings & 1 3/8" machined spindles: Roller bearings for smooth running and quiet operation, 1 3/8" machined spindles for durability, balanced performance, and accuracy. Cast iron housings for added protection and durability. Top greasing spindles: Assures top bearing gets grease. No shields to remove. Single B-section Kevlar belt: Simple one belt design. Kevlar material adds additional strength. Vacuum formed ABS belt guards: No scratching, no rattling. Spring loaded adjustable idler: Allows for constant and proper tension on belt. Better than adjusting gearbox for belt tension. Top Hitch: Top hitch has two hook-up points which allows greater lifting leverage for smaller tractors. Driveline hanger: For ease in hookup and storage of driveline. Keeps driveline off ground. Overall Width: 50 1/2 in. Cutting Height (1/2" increments): 3/4 in. - 5 1/4 in. Deck Material Thickness: 3/16 in. Blade Overlap: 1 1/4 in.